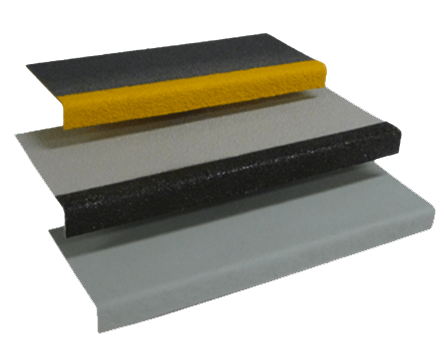 Fiberglass stair tread covers are a convenient way to provide solid, slip resistant footing for existing stairs. These stair tread covers may be installed over wood, concrete or metal steps. 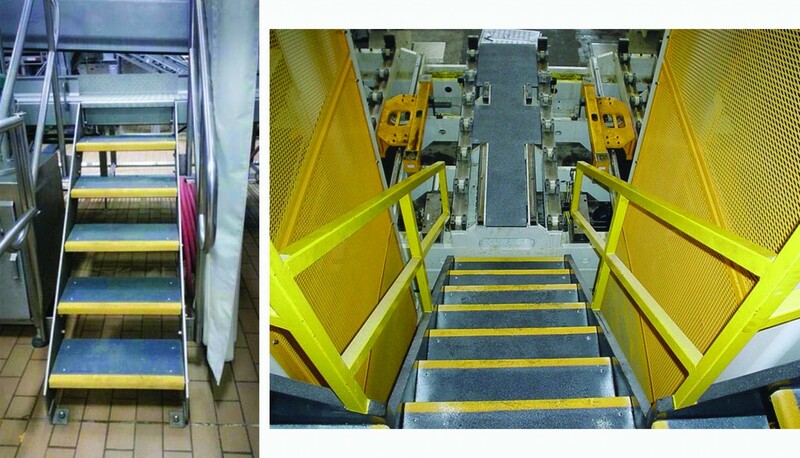 Manufactured with an integral aluminum grit-top surface and a standard nosing of highly visible yellow, making Fibergrate’s stair tread safe and durable. Vi-Corr : A superior vinyl ester resin developed for reliable performance in the toughest environments. It offers outstanding resistance to a wide range of highly corrosive situations, from caustic to acidic. FGI-AM : Improved food-grade isophthalic polyester resin system offers antimicrobial properties to inhibit the growth of bacteria on the surface of the composite to protect the product itself, along with the necessary corrosion resistance to meet the requirements of the food and beverage industry. Corvex : Improved isophthalic polyester resin system outperforms a number of competitive fiberglass and metal products and meets the requirements for corrosion resistance found in industrial, chemical processing and water/wastewater applications. XFR : This eXtra Fire Retardant vinyl ester resin is recommended for use where the fire potential is high. ELS : Extremely Low Smoke resin ideal for tunnel, offshore, mass transit and other confined space applications. ELS exhibits low ignitability, low smoke generation and extremely low smoke toxicity. Super Vi-Corr : Resin systems consists of more than 30 custom formulas engineered to provide corrosion control solutions in applications that are too severe for conventional FRP and other building materials.